DESIGNER SPOTLIGHT: The August spotlight focuses on Bonnie Lewis of 55+ TLC Interior Design, LLC. By 2019, every member of the baby boomer generation will be at least 55-years-old. That puts Arizona-based designer, Bonnie J. Lewis, founder of 55+ TLC Interior Design, ahead of the curve when it comes to focusing on a strong market. Of key importance to that demographic is universal design, which is why it’s a big deal that Lewis’ firm has won numerous awards for it and we’re thrilled to see Hubbardton Forge lighting play a part in those designs. We reached out to Bonnie to find out more. HF: What inspired you to become a Designer and how long have you been designing? BL: After a successful career in corporate marketing management with Fortune 100 firms, and nudging from friends that witnessed my God-given color, design and spatial talent in home renovation projects, I decided to re-career and returned to college to earn a degree in interior design. While in Design College, I founded and operated a successful vacant home staging business. Following graduation in 2010, working for a top commercial senior living interior design firm, I realized my passion for senior living design, which is highly-specialized and incorporates art, science and code-compliance. 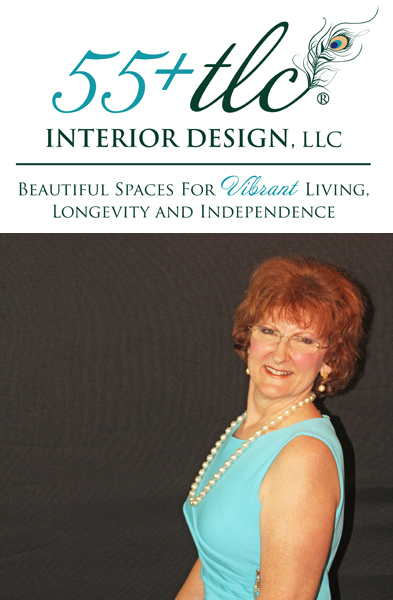 In 2013, I became aging-in-place certified and founded 55+ TLC Interior Design, LLC to make the second half of life the best for Boomer and senior clients, by design. HF: Where do you get your design inspiration? BL: I get design inspiration from nature and new, innovative materials and products. HF: How would you describe your design style? BL: My design style instinct is contemporary but, first and foremost, I design to the preferences, needs and lifestyle of my clients. HF: What were the main requests from your client for this project? BL: The clients wanted their builder “vanilla” master bathroom transformed into a light, bright, colorful, contemporary space that would inspire and accommodate them as they age. They didn’t want to change the bathroom’s basic configuration or move a lot of plumbing. A larger shower and plenty of natural and artificial light were requested, and they liked and wanted to keep their existing vanity cabinets. My project scope included ADA-compliant space planning; vanity and shower wall design; preparing the walls for future support bars; lighting plan design; flooring design; selection and procurement of fixtures, finishes and materials; and project management. HF: Were there any big design challenges? If so, how did you address them? BL: As built, the original shower was a “Jack and Jill” with narrow doors on either side across from built-in cabinetry. It made it feel very tight and closed in. The two water closets had narrow doors and the spaces were small and tight, inaccessible by a walker or wheelchair. The clients wanted to keep the existing large shower window, but wanted a way to block the sun from spilling into the bedroom and waking them early in the morning. Using the same footprint, I created a larger, barrier-free shower by eliminating the existing whirlpool tub. One large shower entry door replaced two smaller doors; both water closets were enlarged for accessibility by eliminating two unused storage areas and installing 36” wide doors with lever handles. This enabled the plumbing for the toilets to remain where it was, while only having to move the shower plumbing 12” to accommodate the new shower depth. Abundant lighting was provided in all areas and automated, waterproof shades were installed on the windows. HF: What are your favorite things about this space? BL: My favorite aesthetic things about this space are the openness, brightness, and the dual focal point vanity walls that are embellished with hand-polished, white porcelain tile, 3-D patterned glass accent tile, beautiful light fixtures, and strategic pops of color. My favorite green / sustainable / environment-friendly thing about this space are the Toto Washlettes, which eliminate the need for toilet paper. This is significant because to make just one roll of toilet paper requires 1.5 pounds of wood, 37 gallons of water, chlorine for bleaching, and 1.3 KWh of electricity. Also, significant amounts of energy and materials are used in packaging toilet paper and in transportation to retail outlets. HF: What made you choose Hubbardton Forge lighting and that design? BL: I chose Hubbardton Forge light fixtures based on their brand of high-quality design and fabrication, as well as their clean, classic, yet unique look.